Acrophobia is “the fear of heights”. 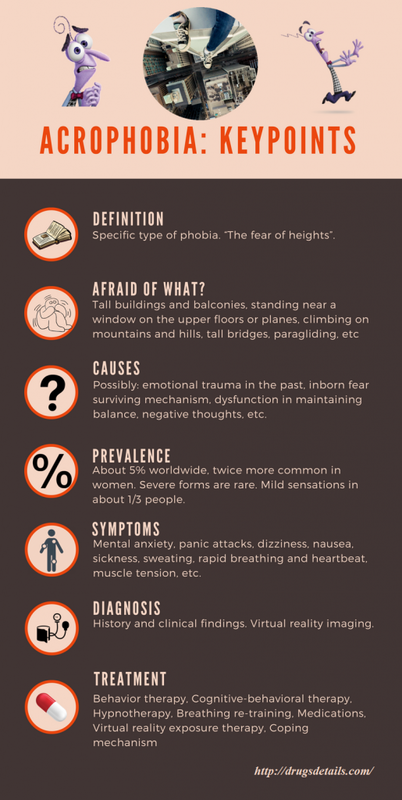 It is categorized as specific type of phobia and subtype of anxiety disorder characterized by persistent, unwarranted, irrational and intense fear or worry of high heights, especially when someone is not particularly high up. Individuals with acrophobia generally have a fear of: being in tall buildings, roller coasters, Ferris wheels, skiing or even standing on high hills or balconies. This fear usually affects the recreational activities one can enjoy. 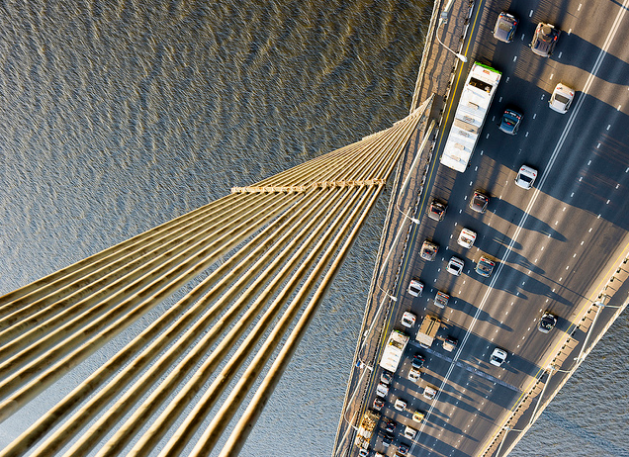 In some rare and extreme cases, the phobia can be so intensive that can affect regular normal-day life so activities such as for example driving on bridges may provoke dizziness and panic attacks as well as other anxiety symptoms. Individuals who are living and working in large cities may find it very hard to attend meetings on higher floors of a building or may experience dizziness in escalators, railings, glass elevators, staircases, etc. 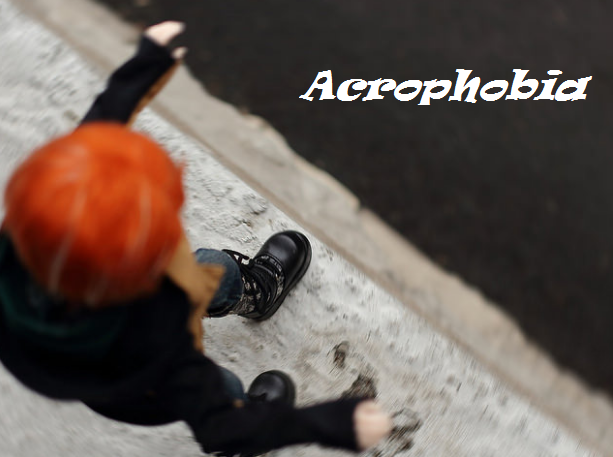 In comparison with other phobias, acrophobia is more commonly accompanied with panic attacks. It is categorized in a particular class of specific phobias, called space and motion discomforts. Acrophobia is pronounced as [ak-ruh-foh-bee-uh]. The word acrophobia comes from Greek words ἄκρον, ákron, meaning “peak, edge, and summit” and φόβος, phóbos, meaning “fear“. Some famous people with acrophobia were/are: Isaac Asimov, Stanley Kubrick, John Madden, Woody Allen, and Whoopi Goldberg. True acrophobia with severe fear is uncommon. According to some statistic data it has been estimated that almost 5% of population have some form of acrophobia with twice as many women affected as men. However, there is a certain condition called visual height intolerance which is not a typical phobia but more like visually triggered fear or anxiety. About 1/3 of people worldwide may have some level of visual height intolerance. Do we born with acrophobia? Rational fear of heights is instinctual in many mammals. Studies have been shown that even human infants are reluctant to crawl onto a floor of glass a few meters high from the ground, showing that the phobia could be innate rather than a learned fear. However, according to some scientists the underlying problem of this phobia is actually negative thoughts. It may relate to bad recognition of visual cues. 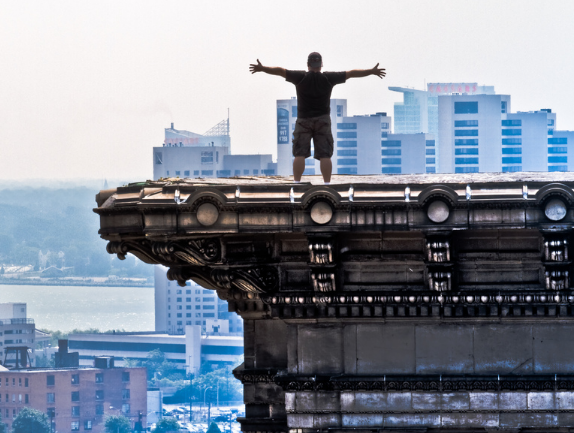 What are patients with acrophobia afraid of? The elevator car will crash. Acrophobics will usually experience these thoughts rapidly and automatically, so much so that they are often ignorant to them. The fear also stalks from the physical sensations related with heights. The negative thoughts of pain from injuries and falls are taken to very extreme levels in acrophobic individuals. Vertigo is often mistermed incorrectly when describing a fear of heights, but it can be described more accurately a dizzy sensation that occurs pathologically, when the person is not actually spinning. However, it can be manifested when looking down from some place that is on high attitude or by looking straight up at a tall object or high place; however this symptom alone does not describe appropriate term of vertigo. Vertigo can be triggered almost by any type of movement such as: walking, standing up, sitting down or by visual perspective changes including: squatting down, looking out of the window of a moving object, walking up or down stairs. Vertigo is medically termed height vertigo when the sensation of vertigo is triggered only by heights. “I have always been afraid of heights. When I was very little, I was afraid to sleep on the top bunk, so I let my older sister have it. I was fine with the bottom bunk. I never would dare get on top of the roof. So, when I decided to get over my fear and to face my phobia. “Approaching the end of our stay in Argentina, Sam and I visited the small town of Cafayate. Known for its amazing landscapes and high altitude wines, we decided to embark on an afternoon tour to visit the different landscapes in the area. Once we reached half way up the ridge, I began to feel anxious and wondered if I should turn back. This would have been easy if not for the people behind me on the narrow path. Sam realised something was wrong and turned back to meet me. He told me that the drop eased off ahead and took my hand to lead me further up the ridge. Similarly to other phobias, Acrophobia also may be the cause of unconscious thoughts trying to create a self-defense mechanism. Emotional trauma in the past, such as a tragic event related with heights, or different scenes that can be seen in movies, may be a root causes for such phobias. In some individuals the fear may be present all the time while in others it may be present only from direct stimulus. Recent studies have cast doubt that a fear of falling along with a fear of loud noises is most commonly proposed inborn or “non-associative” fears. The newer theory of non-associative fear is that an acrophobia is a developed adaptation to a world where falls are significant danger. Researchers have argued that an acrophobia is an instinct found in many mammals. Experiments with visual cliffs have been shown that human infants and children, as well as other animals are reluctant in attempting onto a glass floor with a view of a few meters of fall-space below it. While an inborn wariness about heights is useful for survival, an extreme fear may be related with activities of everyday life, such as standing on a chair or ladder, or even walking up a flight of stairs. A likely predisposing factor is a dysfunction in maintaining balance. The human balance system incorporates vestibular, proprioceptive and nearby visual signals to reckon position and motion. As height increases, visual signals recede and balance becomes lesser even in normal people. However, most patients react by shifting to more reliance on the proprioceptive and vestibular branches of the equilibrium system. But, an acrophobic will continue to over-rely on visual signals whether because of insufficient vestibular function or improper strategy. Locomotion at a higher heights usually require more than normal visual processing. The visual cortex becomes overloaded resulting in confusion. Some researchers warn that it may be ill-advised to encourage acrophobics to expose them to height without resolving the vestibular issues first. The condition can be easily confirmed according to the answers provided by patients. Acrophobia is diagnosed only when the intensity of fear interferes with normal functioning and makes severe distress. Since many people have uncomfortable feeling when they are on high heights, true acrophobia is rarely diagnosed as a mental condition. When acrophobia is diagnosed, healthcare provider will decide adequate medical treatment depending on individual characteristics. He had overcome his fear of heights. Can you do the same? CBT is considered as the treatment of choice for specific phobias especially acrophobia, since it may be the caused by negative thoughts rather than actual fear. The main goal is to eliminate the symptoms of the fear and induce positive thinking. The acrophobe is encouraged to overcome the relation between specific thoughts and high attitudes that causes this phobia. Systemic desensitization as a subtype of this therapy is preferred method in treating acrophobia. Patient is encouraged to relax and imagine the part of phobia, thinking from the least to the most fearful. During this therapy, therapists will expose patients to the primal source of fear, gradually, in order to fully eradicate the phobia. Different exercises are performed in to help the patients in facing the situation. Flooding therapy is commonly used, in which prolonged exposure to the fear-triggering situation helps in observing patient reactions. Hypnotherapy in conjunction with fear exposure may be very helpful to detect the emotional triggers and eliminate the irrational phobia. Breathing retraining is type of treatment that is usually used in conjunction with other methods. Generally, anxiety is related with disrupting breathing issues that leads to hyperventilation. Shortness of breath physiologically will further enhance physical and emotional reactions creating an additive increase of the symptoms. Patients are trained to consciously control their breathing via slow breathing techniques. Exposing the patient to virtual reality (VR) experiences may be very helpful for acrophobia treatment. The patient is placed in the situation of fear itself and monitored until the fear progressively diminishes to a controllable state. Through the means of a computer, reality is recreated in a safer way, both for the patient and for the therapist, and repeated until a positive response is obtained. The VR scenarios can be replicated and tailored to the needs of each patient. Medicines such as anti-anxiety drugs, beta-blockers and anti-depressive drugs are sometimes used to relieve severe symptoms with or without panic attacks related to Acrophobia. Anxiolytics are useful for short-term use and are very effective in reducing the anxiety symptoms of the person so it can be easier to handle their problem. Antidepressants and beta blockers (propranolol) may be good option to relieve physical symptoms like fast heartbeat, palpitation, panic and nervousness. Start facing your acrophobia by exposing yourself gradually to heights gradually. You should start it slowly and adjust it little by little higher until you start to tolerate the height and the feeling of fear start to diminish. Also, always think positively when you start to feel panic.